For a marketer, whose job description includes selling, creating a resume shouldn’t be too difficult. Isn’t that so? Not very likely! Usually, they start off with the same positive thinking that selling being their primary job, it wouldn’t take much effort to prepare a piece of write up about themselves that has a perfect ‘sales pitch’ for their skills and other professional qualities; which could undeniably impress the recruiters. However, this positive thinking vanishes and they end up scratching their heads, as soon as they start thinking about different factors, such as the design, layout, and format, as well as the writing style—all of which, when properly included, makes up for a perfect marketing resume. As a result, they resort to a random format where they simply replace the crucial information with their own details; thinking that the previous experience is all that matters in hiring and that their portfolio can take care of that. That’s true; previous job experience is the top hiring factor for most recruiters. However, your resume is the first document that your recruiters get to see and if you fail to catch their attention with it, why would they bother to check your portfolio. In this post, we’ll learn about the important features of a perfect marketing resume, and how you can create one. Keep reading! 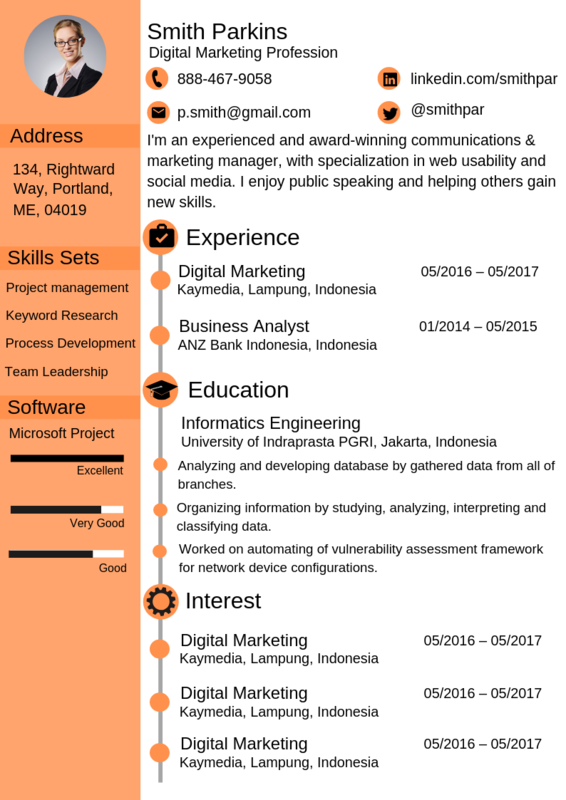 What Do Employers Look for in a Digital Marketing Resume? Qualifications: Employers will evaluate your resume with only one objective in mind; to learn whether you meet the requirements for a particular position. Coherency: Once going through your entire resume, can the reader draw as straight a line as possible between your experience and accomplishments, and the job you’ve applied for? Format: Does it have a chronological or a non-linear format? A chronological format, i.e., following the order in which the events occurred, is preferred as it shows a timeline of events in a candidate’s career. Readability: It’s basically about using a reasonably-sized, legible font, and leaving the required margins in the resume document. Be mindful it should be easy to read both on screen and in a printed out hard copy. Scannability: Are the relevant keywords, job titles, and other major facts sparsely populated throughout the document for improved skimming? Tip: Include enough white space between lines and in the margins to make it scannable, and also put the focus on relevant information. Communication skills: They’ll see your use of words, conciseness, and efficacy of sentences, and obviously the grammatical correctness. Remember your writing will reflect your communication skills, which is a must for any digital marketing position. Selling ability: As already discussed, you can’t get away with this! Just keep it free of bragging; expose your accomplishments, responsibilities, and talents without turning it into an ego trip. So What Are the Things That Make This Resume Stand Out? Simple Formatting: The design, format, and layout of our sample resume are super simple! Only the candidate’s name is highlighted with a colored background to make it easy to recall. Each section is clearly outlined with bold letters and legible font. Also, all major details like the key skills, the name of the organizations, job titles, and working periods are visible from a single skim. Focus on the Core Aspects: Your skills and work experience say all about your qualification for any particular marketing job. Our sample resume also focuses on those two aspects by positioning them in the most visible area of the document. Also, notice there’s no excessive list of skills. Only the most relevant skills are mentioned. Buzzwords like adaptability, ability to work under pressure, time management, self-motivation, etc., are left off. Quantifiable Proof: Did you notice what stands out the most in the work experience section of our sample resume? It’s the quantifiable proof of the achievements mentioned in the statements. These numbers add credibility; they make your achievements look real. Needless to say, no one puts the fake data as any serious employer will contact the previous employer to verify the facts. Upload Your Resume on DigiNekt and Get Shortlisted! The sample resume that we’ve provided is perfect for any digital marketing position that you may be applying for. However, we recommend that you should only take this as an example. Create your own marketing resume that perfectly speaks about your responsibilities and achievements, and upload it on DigiNekt so that it can be found by the right employers at the right time.